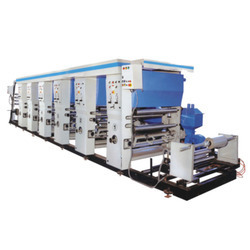 We are a leading Manufacturer of rotogravure printing machine from Ahmedabad, India. We are the manufacturers of precision engineered Rotogravure Rotogravure Printing Machine in various specifications and models. Manufactured using high quality components and materials, these machines are highly appreciated for dimensional accuracy, durability, reliability, abrasion & corrosion resistance and longer service life with optimum performance. These machines goes through strict quality checking to ensure the zero defect end product. Material to be printed: LD,PP,Film, Foil,Paper, Polyster etc. LD,PP,Film, Foil,Paper, Polyster etc. LD,PP,Film, Foil,Paper, Polyster etc.